For all but the cult-like fans of “Mr. Show,” the appearance of “W/ Bob & David” on Netflix is likely little more than a curiosity. For the inquisitive, I recommend a quick scan of the infamous “Mr. Show” sketch “The Story of Everest,” wherein a young climber returns from his daring exploit only to ritualistically make himself a fool in a far more domestic setting. From there, “The Story of Everest” evolves into “The Story of ‘The Story of Everest’,” proving how the “reality” behind the fiction can often be far more entertaining than the fiction itself. This kind of delightful narrative obfuscation is openly on display in The Ruffians’ perennial holiday classic “Burning Bluebeard,” a deconstructionist take on the story of Bluebeard told through the lens of the tragic 1903 Iroquois Theatre fire. This newly updated version of the play moves nimbly between the uncanny and the self-reflexive; the cartoonish and the nightmare-inducing. Much like “Mr. Show,” “Burning Bluebeard” has its own belligerently devoted fans who revisit this piece year after year. And with good reason: The Ruffians push the limits of circusry and clowning within the admittedly confining space of the Den’s Heath Main Stage. 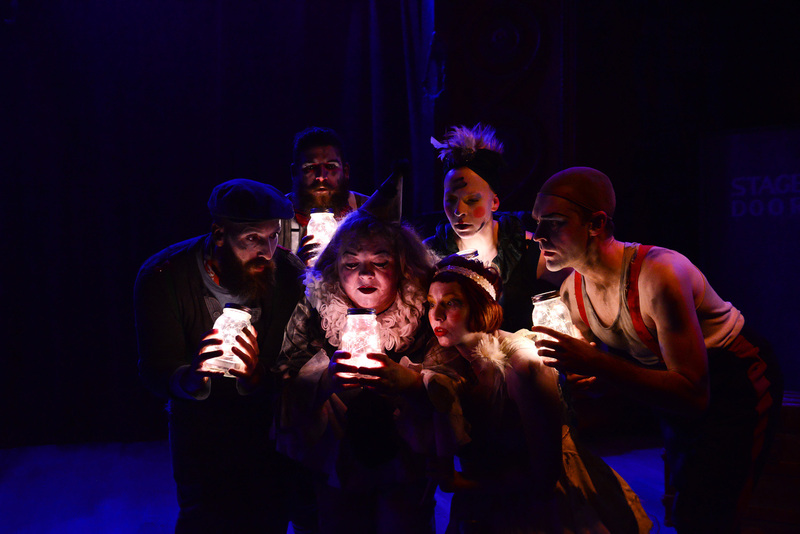 “Burning Bluebeard” gamely plays with the low/high art divide by pairing corny one-liners with choreographed homicidal dance routines set to the music of The Knife. And while the hammier elements will always be to the taste of individual audience members, the play’s emotional climax is guaranteed to raise spirits. What fans of “Mr. Show” will be giddy to explain to you about “The Story of Everest” reveals a truism that theater artists understand all too well. In between cutaways during the sketch, a meticulous prop was painstakingly put together. Once the cameras started rolling, the aforementioned clumsy climber smashed it to pieces. This was repeated for several scenes. It was an element of the gag designed exclusively for the live studio audience, lending the already mythic humor a further layer of depth. The Hypocrites present The Ruffians at The Den Theatre’s Heath Main Stage, 1329 North Milwaukee, the-hypocrites.com, $15-$36. Through January 10.